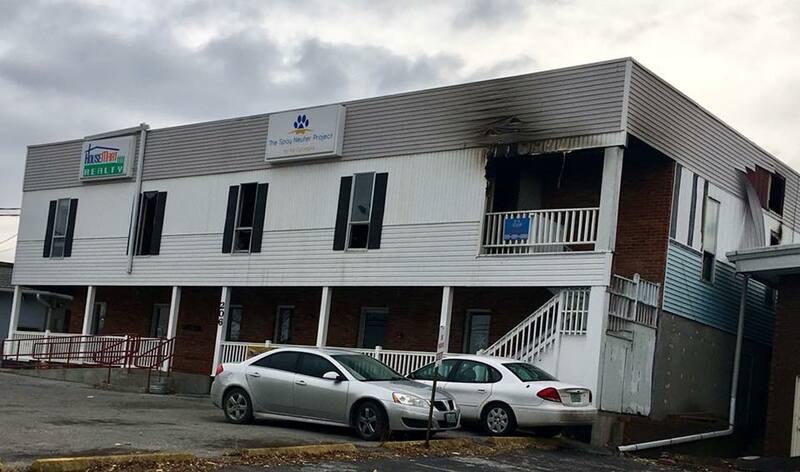 In the early morning hours of February 4th, The Spay Neuter Project sustained extensive damage.The fire was contained to the second story, but the clinic sustained considerable water and smoke damage which occupies the entire first floor. Unfortunately the surgical suite received the most damage. Luckily no one was in the building, except for our beloved clinic cat Bubby who was stayed overnight in one of the offices upstairs during cold spells, and lost his life. We are humbled by the outpour of support we have already received, and thank you for your kindness and concern! We will keep you posted on any progress. 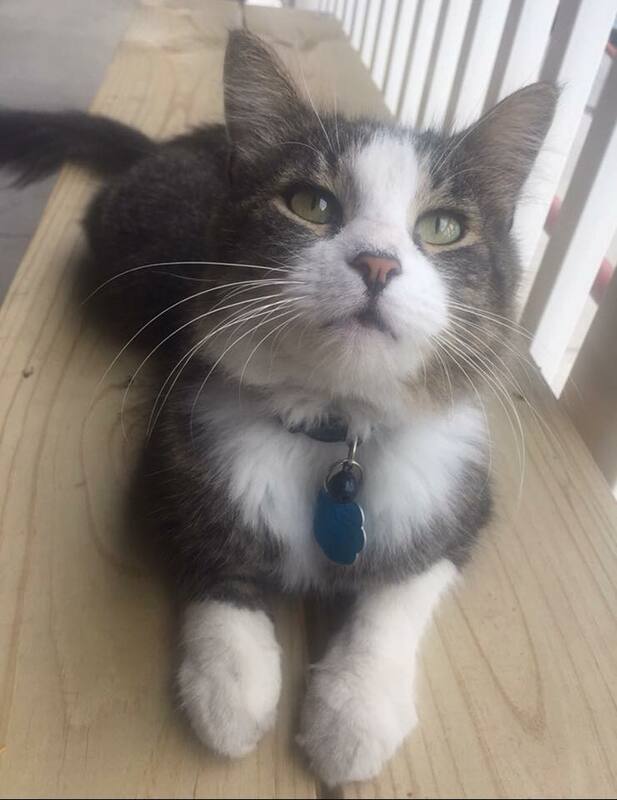 RIP dear sweet Bubby. You will truly be missed by all. 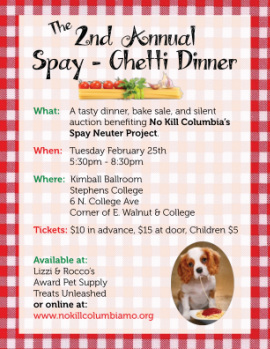 The 6th Annual Spay-Ghetti Dinner was an amazing evening to celebrate the importance of affordable spay and neuter! We,ve tallied the numbers and the festive evening raised over $14,000 for our beloved pets and community cats! Thank You to everyone from the bottom of our hearts; Bleu Events, First Presbyterian Church, our generous Sponsors, the talented Jay Pellis and The Burney Sisters, Silent Auction donors, incredible Bakers, Volunteers, and to all who attended. Together we will continue to make a difference for our furry friends! THANK YOU TREATS UNLEASHED FOR YOUR COMMITMENT TO OUR COMMUNITY PETS! The 5th Pet Expo Unleashed rocked! We are so appreciative to once again be the beneficiary of this fun filled day for pets and their families in addition to their Spotlight Treats. Thank you ​Treats Unleashed for believing in the importance of affordable spay and neuter services, helping families keep their pets happy and healthy while reducing the pet population. Your commitment and generosity for our community pets is pawsome! Even though it was raining cats and dogs at times, we had a great turnout at The Spay Neuter Project Open House! We were eager to share with those who made the dream of offering low cost services to all of Mid Missouri a reality. The clinic opened April 6th, and has already performed over 150 surgeries! Thank you again for your support with this project. Together we have already made a difference in reducing the number of unwanted companion animals in Boone County and surrounding communities. For those who were unable to attend, photographer and friend Scott Peterson took some great photos to showcase the clinic. 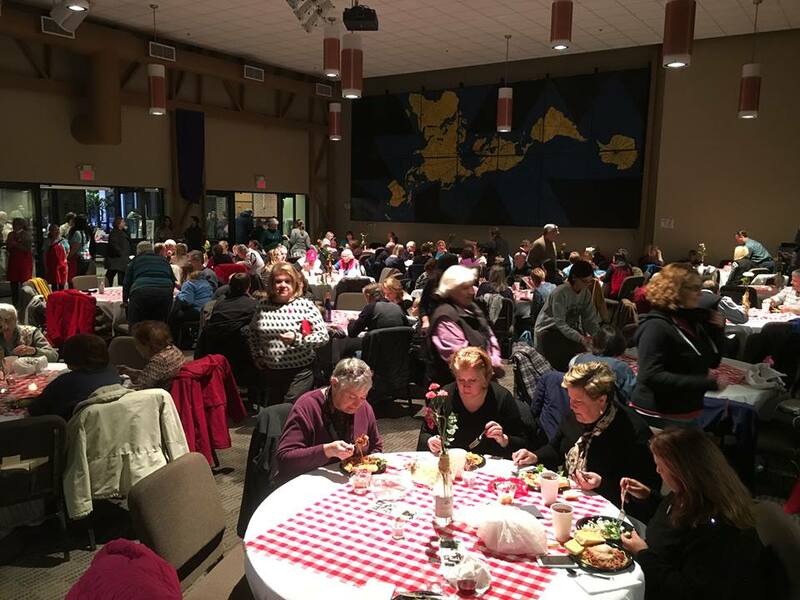 Wow...what an amazing turnout for the 5th Annual Spay-Ghetti Dinner! THANK YOU to all who attended, donated, baked, volunteered, and to our generous sponsors; the wonderful folks at Bleu Events for the delectable dinner, Creekside Pet Center, and Zimmer Radio and Marketing Group. It was a beautiful evening to raise awareness and celebrate the importance of affordable spay and neuter services in our community. The Spay Neuter Project finished in 13th place with $9700 in donations. In addition we were won a $1000 challenge grant, Highest Amount Raised by a First Year ComoGives Organization for a total of $10,700. How awesome is that! We may be a small organization but with your support together we will continue to make a big difference reducing the pet population while helping families keep their pets happy and healthy, Thank you! We would like to thank all who attended and donated, and to our sponsors and volunteers for Art Unleashed 2016. The evening raised over $9000 to help the clinic continue to keep their fees affordable for pets and their families! We couldn’t do what we do without your support. Thank you for your compassion and commitment to help our beloved pets. Together we will continue to make a difference for our furry friends! items, volunteered or contributed in any way. Thank you Coach Anderson, Coach Pingeton and Mizzou Tiger Basketball for your support for The Spay Neuter Project! 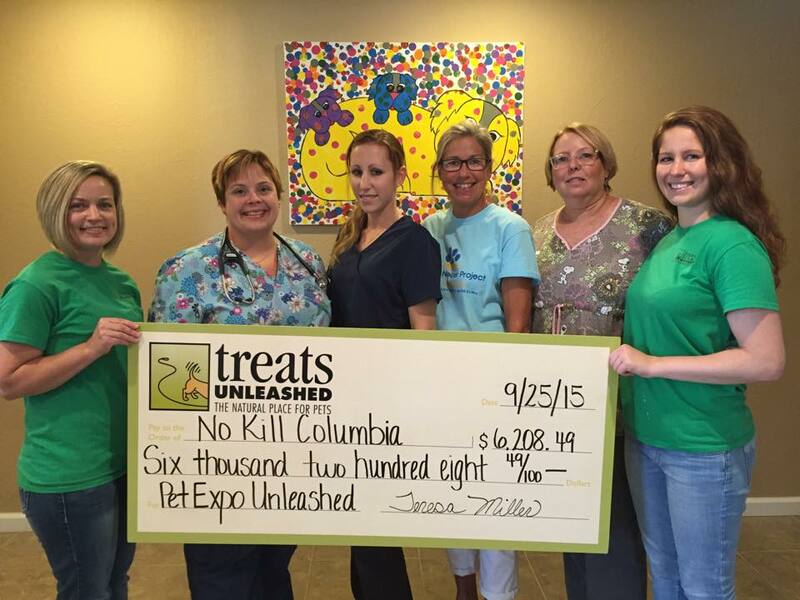 Treats Unleashed presented this check to us as the beneficiary of Pet Expo UNLEASHED 2015! Words can’t convey our appreciation for their continued support and generosity for No Kill Columbia and The Spay Neuter Project. What a fun-filled day it was for families and their four-legged furry kids. Pictured; Manager of Treats Unleashed Columbia, Jennifer Hartman, Clinic Veterinarian,Dr. Peggy White DVM, Clinic Registered Veterinarian Technician, Carissa Luttrell, Member of No Kill Columbia, Liz Burks, Clinic Office Manager, Alyce Bader-Cooley, Treats Unleashed Columbia Assistant, Amber Caldwell. 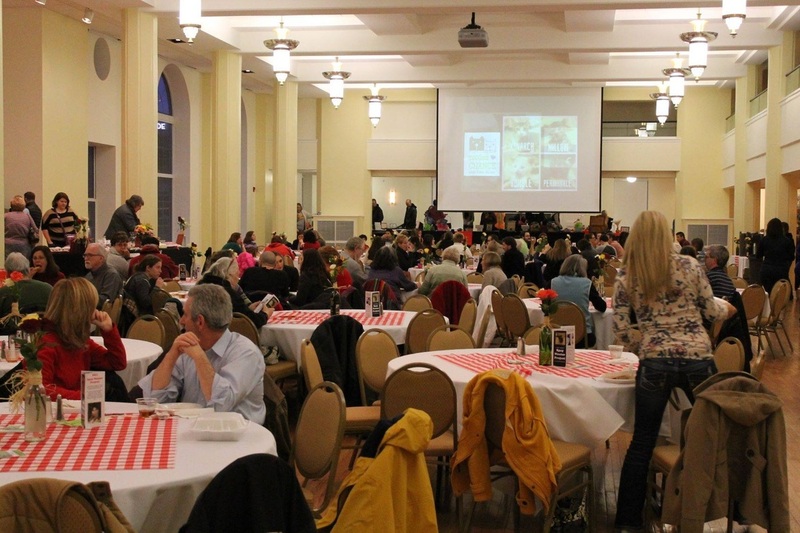 World Spay Day 2015 and our beloved companion animals at the 3rd Annual Spay-Ghetti Dinner! THANK YOU to our sponsors, local businesses and individuals who donated amazing auction items and baked delicious creations for the bake sale, to the incredible crew of volunteers, the entertaining and talented Jazz trio and to ALL who attended! 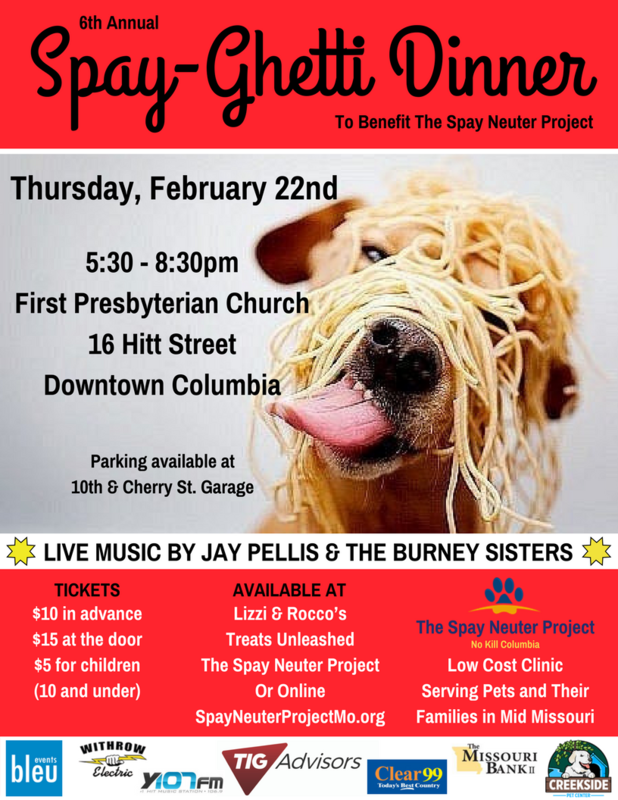 Proceeds will help fund affordable spay neuter services for all pets and their families in Mid Missouri at the Spay Neuter Project..... opening this April. who made this delicious event possible! Check out all the pawsome pictures courtesy of photographer Scott Peterson. Thank you Scott for capturing the evening! An Evening For All Pet and Art Lovers! all donated to support reducing the number of unwanted and homeless pets. THANK YOU TREATS UNLEASHED FOR AN AMAZING FUN DAY! It was a beautiful fun filled day for all who attended Treats Unleashed 2nd Annual Columbia Pet Expo and 5K! Paws up to our friends at Treats Unleashed, we are so appreciative to have been chosen once again as the beneficiary for the Expo. Your commitment and generosity for our community pets is awesome! We were presented with a check for $3,500! All proceeds will go towards opening the Spay Neuter Project, a high volume. low cost spay neuter clinic to serve all of Mid Missouri. Check out all the furry friends who enjoyed the day as much as their humans! 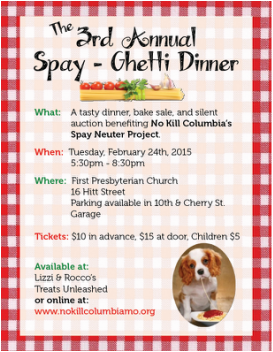 The 2nd Annual Spay-Ghetti Dinner fundraiser raised $7,082 for the Spay Neuter Project! Thank you so much to all who attended and to our hardworking, wonderful volunteers who made it a great success! We served nearly 400 people Tuesday night. We would like to acknowledge our wonderful sponsors; Stephens College for the beautiful venue, Fresh Ideas Catering for the scrumptious dinner, Joe Machens Ford & Toyota for the well received and needed shuttle service, along with the numerous local businesses who donated products and services for the silent auction, and last but not least all the fabulous bakers who donated their yummy baked goods! We thank you all for contributing to the success of an amazing night for our furry four legged friends! In July 2011, Brent and several others formed Kansas City Pet Project to bid on the contract to run the Kansas City, MO pound - a place where for decades more animals died there than were saved. Since KC Project took over in January 2012, adoptions have increased by more than 100%. In July, 2013 KCPP celebrated 12 consecutive months with a 90%+ live release rate – which makes KCPP the fourth largest open admission, no kill shelter in the US. Homeless Pets Conference (2008, 2012, 2013), and the American Pets Alive (2014). followed with a question/answer session. 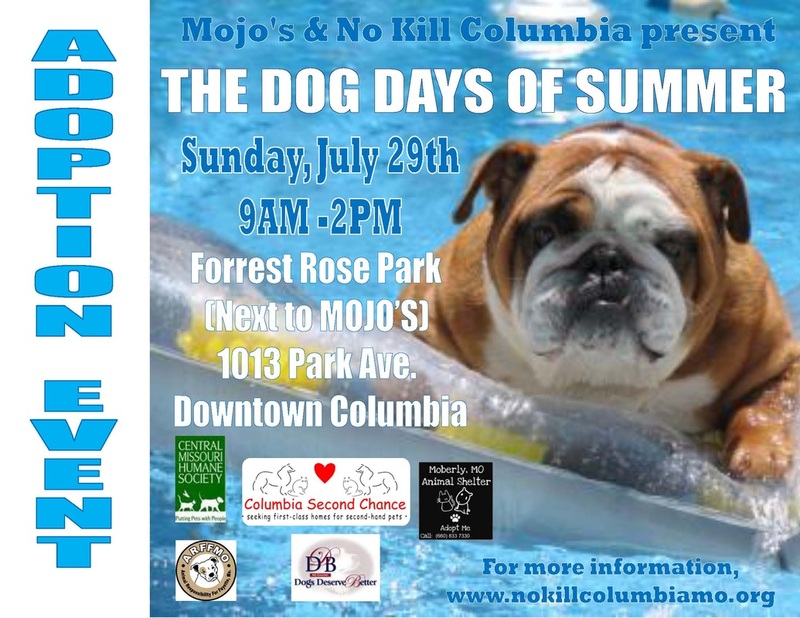 We hope you will join us and learn from our neighbors in Kansas City how we too can become a No Kill community. Please be sure and check out KC Pet Project's informational website to learn more. No Kill Columbia is pleased to announce 94 homeless pets found their forever homes at the 2013 ASPCA Mega Match-A-Thon! It was a day filled with tons of human smiles, lots of tail wagging and feline purring. There are so many who made this amazing one day event possible. We would like to express a heartfelt thank you to the ASPCA® for once again granting us such a wonderful opportunity, the participating organizations who worked tirelessly to prepare for the big day, the 80 plus volunteers who assured every potential adopter exceptional customer service, local businesses who united together in support to make this day such a joyous one for our furry friends, and those in our community who choose to adopt and save a life! Thank you! who caught so many special moments of the amazing day. What an exciting and fun evening it was to benefit the pets in Mid-Missouri! Art Unleashed raised $22,252 for the Spay Neuter Project. WOW is right! 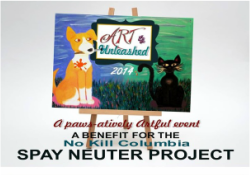 No Kill Columbia would like to express our deepest gratitude to the Art Unleashed committee members and chair, Susan Bell, and the awesome volunteers who gave so much of their time, talents and energy to put on such an amazing event on a shoe string budget. Paws up to all the generous artists who believe in our mission for proactive change, local restaurants who shared their delicious creations for all to enjoy, Ali Briley, Uncle Scotty from Clear99, and auctioneer Brent Voorheis who kept the crowd entertained, and to you the community for your enormous support. Together we will reduce the unwanted number of animals entering shelters and rescues, and save lives with the Spay Neuter Project. We are that much closer to our goal! Thank you! THANK YOU TO OUR FRIENDS AT TREATS UNLEASHED! Treats Unleashed held the first ever Columbia Pet Expo Unleashed, Sat. June 22nd at the Canine Sports Center. It was a fun filled day for the entire family including the furry ones! All proceeds benefit NKC Spay Neuter Project. 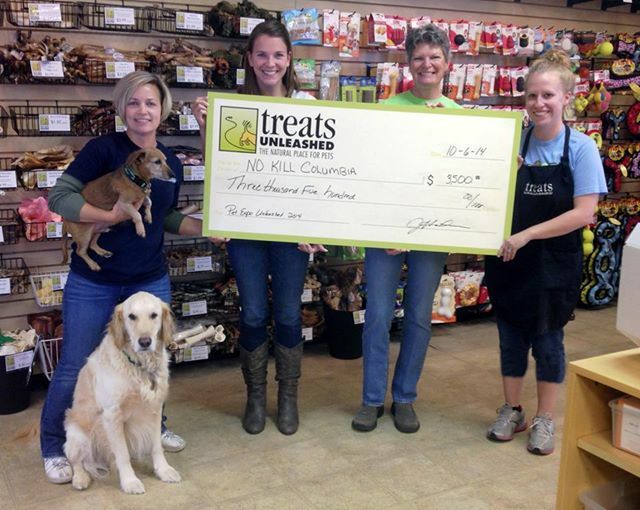 Our friends at Treats Unleashed are excited to announce, the event raised an amazing $2,428.21! WOW! Thank you Treats Unleashed for all your hard work! The animals in Mid Missouri will reap the rewards! Everyone had a blast at the Old Time Photo shoot held at Lizzi & Roccos! Here is a sample of all the adorables in their western best! 75 degree temperatures in the end of July! Boy oh boy did we luck out and had the most beautiful day for the Ruff Riders Rally Poker Run! The sun was shining, and we had riders lined up to register at 9:30. It was a fun day for all, and ended with a touching ceremony, a "Quilt of Valor" presented to Randall W. Quirk in honor for his service in the Navy during the Vietnam war. Thank you Mr. Quirk for your service for our country, to our friends at Mid-Missouri Harley Davidson, and thank you to everyone who donated awesome prizes, participated, and volunteered. The event raised $1,000 for the Spay Neuter Project and we look forward to the 2nd Annual Ruff Riders Rally! Miss Bella sure does now how to plan an awesome carnival! There were fun and games for the entire family including the 4 legged members! We would like to give a shout out to some of our great sponsors; Capt'n Dookie, Lizzi & Rocco's Natural Pet Market, Treats Unleashed - Columbia, Drs Fosters and Smith, Perche Creek Golf Club, Rockin' Rents Bounce Houses, Award Pet Supply, and Buck's Ice Cream. Paws up for Bu Ting Xi Kung Fu Academy for their entertaining demonstrations, talented and popular face painter Emilie, the awesome crew from the Animal Science Graduate Studies Program for the delicious burgers and dogs, and our wonderful team of devoted volunteers! Thank you to all who attended to support the Spay Neuter Project! Pints for Paws, sponsored by our friends at Lizzi & Rocco's Natural Pet Market and Broadway Brewery to benefit The Spay Neuter Project was a wonderful success! The evening raised $2,500 for the Spay Neuter Project! An enormous THANK YOU goes to our friends and sponsors, and a round of applause to all who braved the stormy weather for a great cause! Thanks to your generosity, we were able to deliver much needed supplies to the Shawnee, OK animal shelter. We would like to thank Award Pet Supply, Lizzi & Rocco's Natural Pet Market, and Treats Unleashed - Columbia for serving as donation drop off sites. 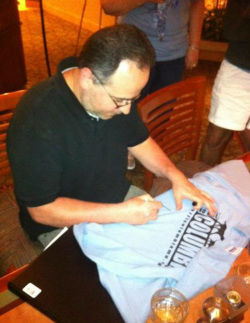 Thank you to Show-Me STATE GAMES for their generous T-shirt donation! The animals and people affected by the recent tornado appreciate your support. 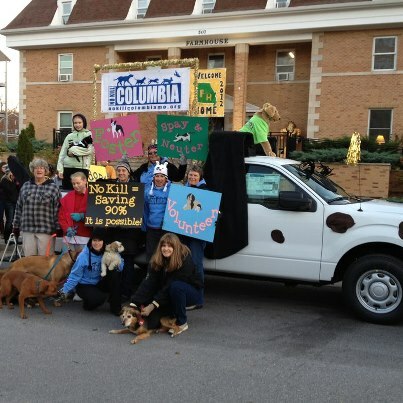 Columbia MO pet lovers rock! 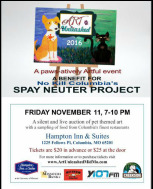 WHAT DOG & CAT WILL BE THE FACE OF THE SPAY NEUTER PROJECT? Franceen and Maggie! You are now the faces of the NKC Spay Neuter Project! We would like to say THANK YOU to all of the contestants, together you raised $1,777 with all proceeds benefiting the Spay Neuter Project! Thank you to every one that voted and shared the contest, we appreciate your support so very much! It's Raining Cats & Dogs 5K was a tremendous success! Our friends and hosts from MU rocked it! $2,617.93 to benefit the Spay Neuter Project! The day also brought joy to families who found their forever four legged friends. hearts, THANK YOU for supporting the Spay Neuter Project. Together we will save lives of our 4 legged friends! Also, paws up to Joe Machens Ford for allowing us to transform one of their 2012 Ford Trucks into a spotty, furry four wheeled friend. We appreciate your generosity and support! http://www.snap-cats.org/ and LIKE them on Face Book. No Kill Columbia was featured in the September issue of Inside Columbia magazine. Thank you Inside Columbia for the feature! UNITING TOGETHER TO SAVE LIVES OF OUR FURRY FRIENDS AT THE DOG DAYS OF SUMMER ADOPTION EVENT! 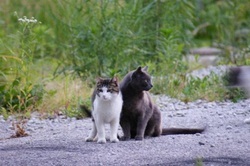 UPDATE: Uniting together, SNAP, Columbia Second Chance and NKC have rescued 30 abandoned cats from the closed Regency Trailer Park and No Kill Columbia assisted with the 3rd Kittycaravan to Sedalia for low cost S/N and rabies! The fundraiser held at Cafe Berlin raised over $900 for these deserving felines. Thank you to all who participated! Members of No Kill Columbia traveled to Topeka Kansas, to attend the Nathan Winograd, "Building a No Kill Community" 2012 No Kill Seminar. A Stanford Law School graduate, Winograd created the first No Kill community as Executive Director of the Tompkins County SPCA in 2001. In 2004, he founded the No Kill Advocacy Center, dedicated to creation of a No Kill nation, and author of the award winning book, Redemption, The Myth of Pet Overpopulation and the No Kill Revolution in America. These are just a few of his numerous accomplishments due to his lifelong passion for helping animals. We were inspired by his compassion and dedication for all animals, and empowered by his message. Mizzou basketball player, Steve Moore visited NKC's booth at the Earth Day Festival and proudly wore our shirt! He's such a nice young man and an avid animal lover. Thanks Steve! Congratulations to the winner of our raffle for a new Lupine collar and leash, Maija Steinberg! The ASPCA Mega Match-A-Thon was a huge success! 142 four legged friends found furever new homes. We would like to express a heartfelt thank you to the ASPCA® for granting us such a wonderful opportunity, the participating organizations who worked tirelessly to prepare for the big day, the 100 plus volunteers who assured every potential adopter exceptional customer service, and to members of our community who united together in support to make this day such a joyous one for our furry friends! 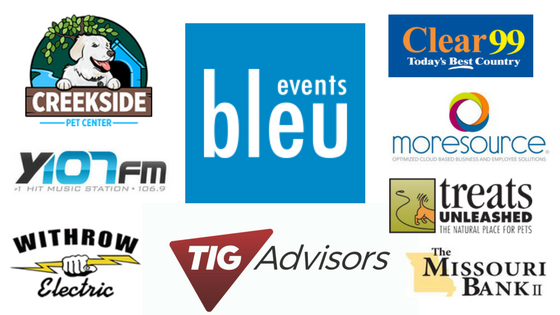 THANK YOU to the following businesses for their generosity and support! B & B Bagel, Scotty and Clear99, Clovers, Cottonwood RV Park, Culligan Water, Dan Davis Construction, Focus on Health, Four Seasons Pet Services, Gerbes, Hyee, Ink Factory, Lakota Coffee, Lizzi & Rocco's, Lupine Collar and Leashes, The Olive Garden, Orscheln, Pizza Hut, Sams, Sheppers Distributing,Socket, Subway,Tiger Ice, TMAC, Treats Unleashed, WalMart, Wilcoxson Builders, Withrow Electric, iMarc Tags-Western Engravers and Whitney and Y107. We will ever be grateful to our friends at Mid City Lumber Company for donating the location for the event!